In this life I'm a woman. In my next life, I'd like to come back as a bear. When you're a bear, you get to hibernate. You do nothing but sleep for six months. I could deal with that. 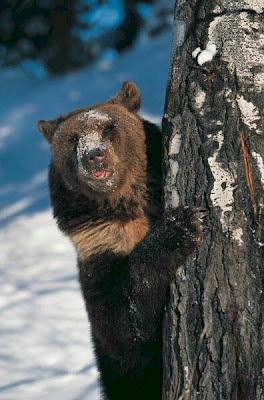 Before you hibernate, you're suppose to eat yourself stupid. I could deal with that too. When you're a girl bear, you birth your children (who are the size of walnuts) while you're sleeping and wake up to partially grown, cute, cuddly cubs. I could definitely deal with that. If you're a mama bear, everyone knows you mean business. You swat away anyone who bothers your cubs. If your cubs get out of line, you swat them too. I could deal with that.